‘LIAS! ‘Lias! Bless de Lawd! Don’ you know de day’s erbroad? W’ile I meks yo’ boa’d an’ keep? Don’ you hyeah me, ‘Lias –you? W’ile you sleep –w’y hit’s a sin! Bu’nin’ up de daylight too? ‘Lias, don’ you hyeah me call? Don’ you hyeah me w’en I speak? Ca’line, bring me dem ah sticks! Look hyeah, don’ you daih to frown. ‘Sides jes’ cleanin’ aftah you. Looks jes’ lak a feddah baid. You sha’ n’t roll yo’ eyes at me. Come hyeah; bring me dat ah strap! An’ you sholy got me wrong. Jes’ you whimpah ef you daih! Seem lak I mus’ lose my grace. 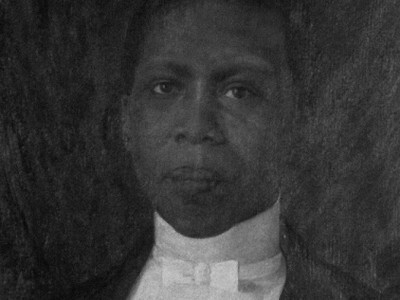 Paul Laurence Dunbar was the first African-American poet to garner national critical acclaim. Born in Dayton, Ohio, in 1872, Dunbar penned a large body of dialect poems, standard English poems, essays, novels and short stories before he died at the age of 33. His work often addressed the difficulties encountered by members of his race and the efforts of African-Americans to achieve equality in America. He was praised both by the prominent literary critics of his time and his literary contemporaries. Dunbar was born on June 27, 1872, to Matilda and Joshua Dunbar, both natives of Kentucky. His mother was a former slave and his father had escaped from slavery and served in the 55th Massachusetts Infantry Regiment and the 5th Massachusetts Colored Cavalry Regiment during the Civil War. Matilda and Joshua had two children before separating in 1874. Matilda also had two children from a previous marriage. The family was poor, and after Joshua left, Matilda supported her children by working in Dayton as a washerwoman. One of the families she worked for was the family of Orville and Wilbur Wright, with whom her son attended Dayton’s Central High School. Though the Dunbar family had little material wealth, Matilda, always a great support to Dunbar as his literary stature grew, taught her children a love of songs and storytelling. Having heard poems read by the family she worked for when she was a slave, Matilda loved poetry and encouraged her children to read. Dunbar was inspired by his mother, and he began reciting and writing poetry as early as age 6. Dunbar was the only African-American in his class at Dayton Central High, and while he often had difficulty finding employment because of his race, he rose to great heights in school. He was a member of the debating society, editor of the school paper and president of the school’s literary society. He also wrote for Dayton community newspapers. He worked as an elevator operator in Dayton’s Callahan Building until he established himself locally and nationally as a writer. He published an African-American newsletter in Dayton, the Dayton Tattler, with help from the Wright brothers. His first public reading was on his birthday in 1892. A former teacher arranged for him to give the welcoming address to the Western Association of Writers when the organization met in Dayton. James Newton Matthews became a friend of Dunbar’s and wrote to an Illinois paper praising Dunbar’s work. The letter was reprinted in several papers across the country, and the accolade drew regional attention to Dunbar; James Whitcomb Riley, a poet whose works were written almost entirely in dialect, read Matthew’s letter and acquainted himself with Dunbar’s work. With literary figures beginning to take notice, Dunbar decided to publish a book of poems. Oak and Ivy, his first collection, was published in 1892. Dunbar moved to Toledo, Ohio, in 1895, with help from attorney Charles A. Thatcher and psychiatrist Henry A. Tobey. Both were fans of Dunbar’s work, and they arranged for him to recite his poems at local libraries and literary gatherings. Tobey and Thatcher also funded the publication of Dunbar’s second book, Majors and Minors. It was Dunbar’s second book that propelled him to national fame. William Dean Howells, a novelist and widely respected literary critic who edited Harper’s Weekly, praised Dunbar’s book in one of his weekly columns and launched Dunbar’s name into the most respected literary circles across the country. A New York publishing firm, Dodd Mead and Co., combined Dunbar’s first two books and published them as Lyrics of a Lowly Life. The book included an introduction written by Howells. In 1897, Dunbar traveled to England to recite his works on the London literary circuit. His national fame had spilled across the Atlantic. After returning from England, Dunbar married Alice Ruth Moore, a young writer, teacher and proponent of racial and gender equality who had a master’s degree from Cornell University. Dunbar took a job at the Library of Congress in Washington, D.C. He found the work tiresome, however, and it is believed the library’s dust contributed to his worsening case of tuberculosis. He worked there for only a year before quitting to write and recite full time. In 1902, Dunbar and his wife separated. Depression stemming from the end of his marriage and declining health drove him to a dependence on alcohol, which further damaged his health. He continued to write, however. He ultimately produced 12 books of poetry, four books of short stories, a play and five novels. His work appeared in Harper’s Weekly, the Sunday Evening Post, the Denver Post, Current Literature and a number of other magazines and journals. He traveled to Colorado and visited his half-brother in Chicago before returning to his mother in Dayton in 1904. He died there on Feb. 9, 1906.